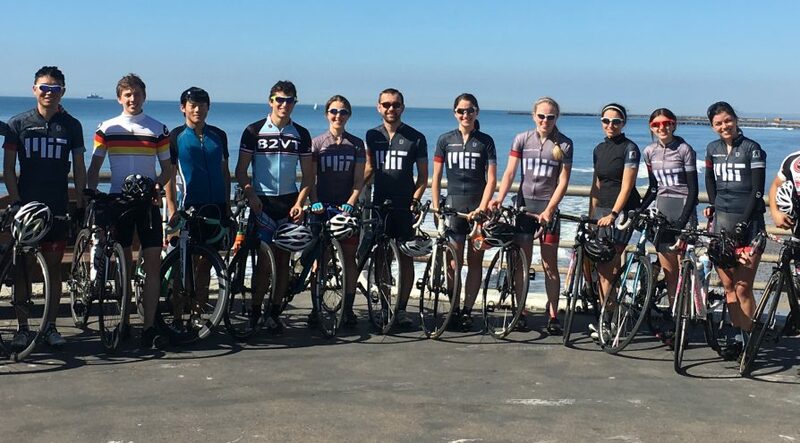 This is a guest post from Paul Johnson, the Founder of Compression+Design (www.compressiondesign.com), a resource for fitness enthusiasts, cyclists, and runners. One of the biggest trends in cycling – and definitely the major trend in indoor cycling – is the rise of the smart trainer. Smart trainers allow you to do precision intervals, ride along with a video of your favorite place, or cycle with a bunch of virtual friends, all from indoors. The first smart bike trainers hit the market in 2008, but it took a few years for them to really catch on. In the past two years, they have been on an amazing growth curve. Today, there is no shortage of smart bike trainers or the apps to go with them. We will provide a quick overview of the more popular options. The first thing to know about the smart trainer market is that it is about both hardware – the trainers themselves – and software – the apps that run with the smart trainers. For best performance, they need to be compatible but are often not the same brand. In fact, many of the cycling app makers don’t even make trainers, although most trainer manufacturers have introduced some form of app. With one exception (Peleton, which will be note below) don’t worry about the brands – just invest the best of breed for your particular needs. The first thing you will need is a physical trainer to mount your bike on. The trainer market used to be comprised of simple, mechanical trainers that were basic but worked well (explained in-depth, here). Popular brands were Kurt Kinetic and CycleOps, and they were reliable. Those brands still exist, and are as reliable and popular as ever. One thing that has changed, though, is that they have all introduced smart trainer options. Other companies, like Wahoo and Tacx, then entered the market focusing mainly on smart trainers. 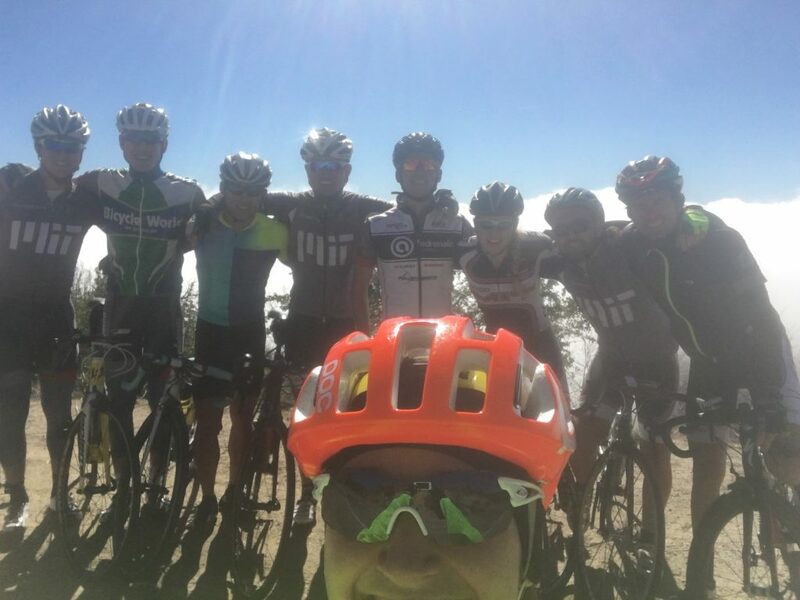 As you look for a trainer, you will want to be sure to focus on a smart trainer if you plan to integrate it with online or Ipad apps for your training or virtual social rides. There is a way to make a non-smart trainer compatible with these apps, but it involves a workaround and is clunky, with extra cords and gadgets. We think you are better off spending the extra money on a trainer that is ready to integrate from day one. We especially like the direct-drive trainers, where you remove your wheel and power the trainer directly with your chain. You lose less power this way, and the power measurements are a little more accurate. Once you have a trainer, you need to look for an app that you like. There are literally 20 smart trainer apps on the market, some way better than others. 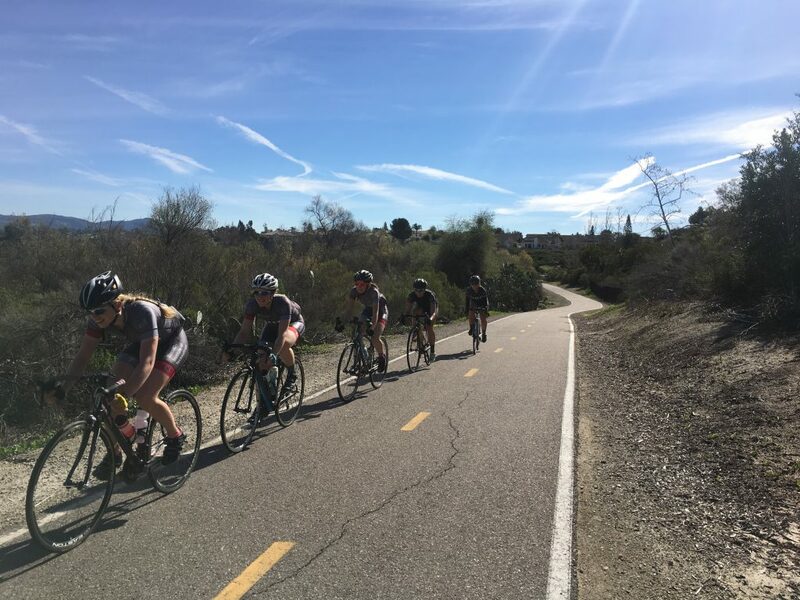 Things to consider are the number of workouts provided on each app, the type of coaching you will receive, and which apps your friends might be on in the event you want to do “virtual group rides”. Apps typically charge a monthly fee ranging from $5 to $20. Our favorite, by far, is Zwift. It has been gaining market share for a couple years, and is compatible with virtually every app on the market. 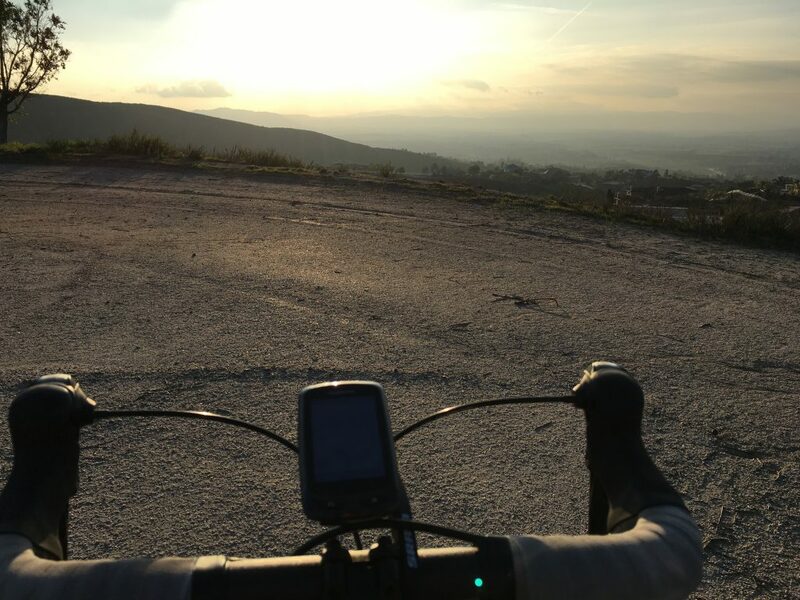 It offers social group rides, competitions with other users, structured workouts, and destination video rides. The competition rides can actually get pretty intense, with riders from around the world trying to crank out more power than each other and rise up the leaderboard. Tacx also offers a good app with plenty of structured and unstructured options, but it doesn’t quite have the user base of Zwift – meaning you are more likely to have friends who ride on Zwift. There are others, but we think these are the two to consider, unless……. It is hard not to notice Peloton right now – they must have a rich marketing budget. 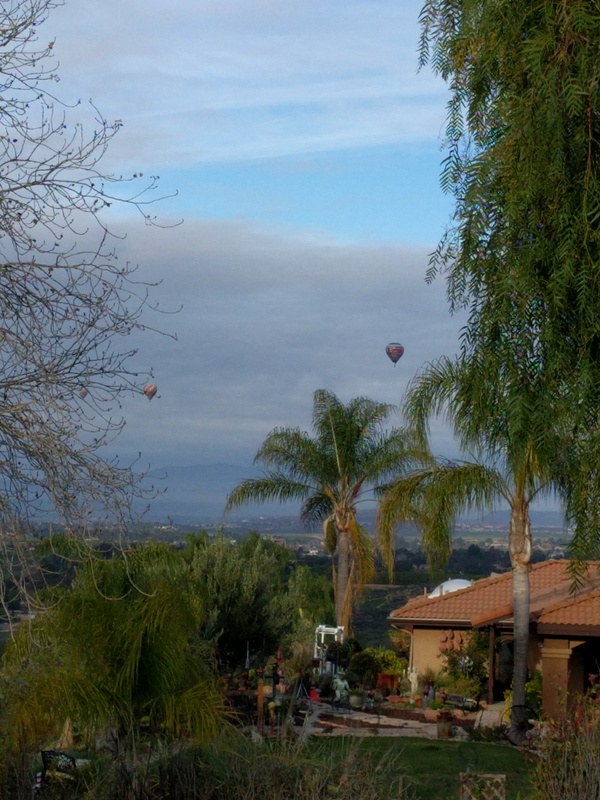 Peloton is everywhere. 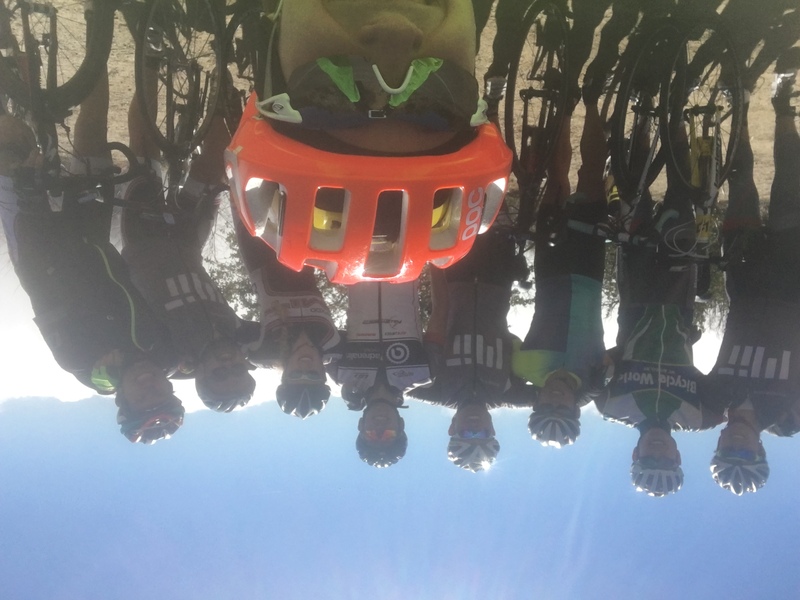 There is a lot to be said about Peloton – great bikes, lots of users, excellent classes and coaching. People who use Peloton swear by it, and it is almost like a cult. We have two issues with Peloton for the typical, budget-conscious user though. First, it is expensive – the bike costs $2,000, and the service costs $40 a month. Second, you can’t train on your own bike – you get best results on the $2,000 Peloton bike. Actually, you can use your own bike on a smart trainer with the Peloton app, but the experience is comprimised and you might as well just do Zwift. There are many more options than what we listed above, but we tried to single out the options we felt were the best for riders today. Regardless of which trainer / app combo you choose – or if you splurge on Peloton – we think that moving to a smart trainer can be a gamechanger for your training! 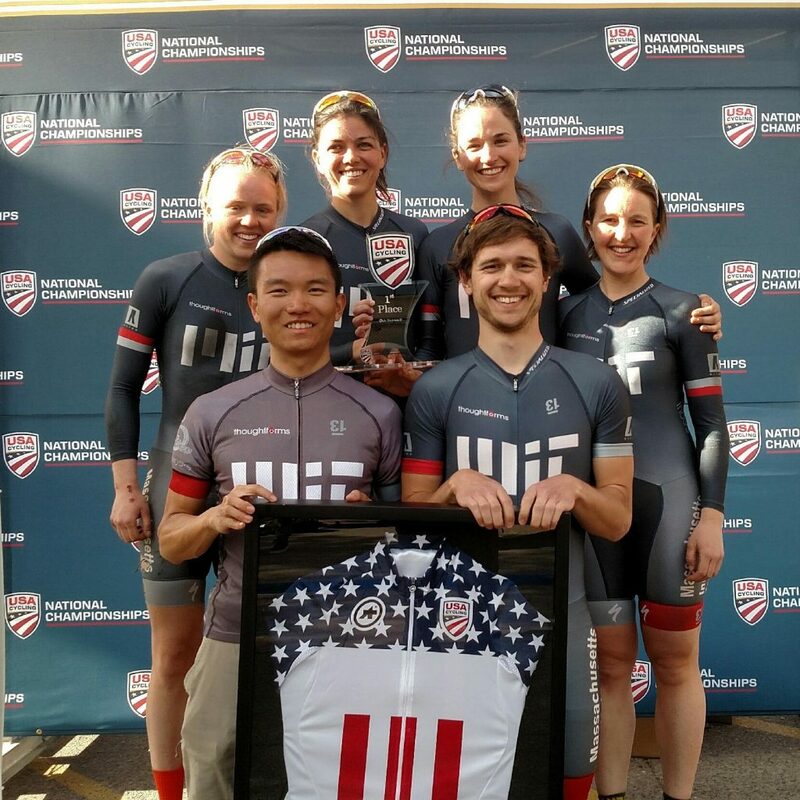 2017 DII Club Omnium National Champs! 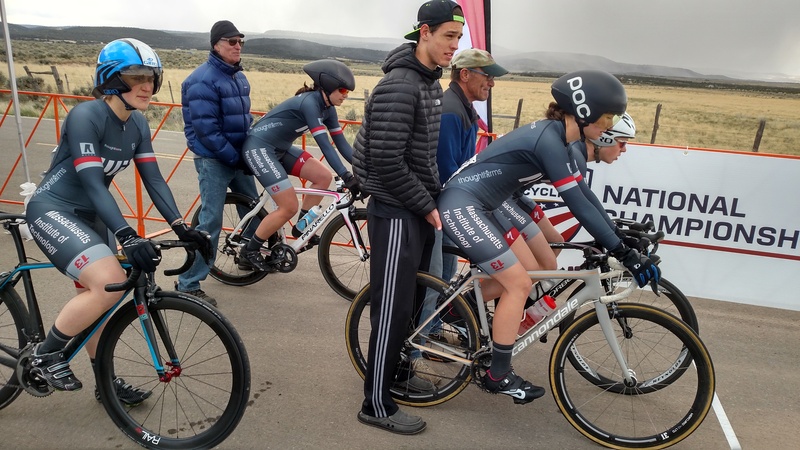 This year we were able to take 8 students (plus Coach Kolie) to the Collegiate Road National Championships in Grand Junction, CO. We had 4 A women: Katy Olesnavage, Anne Raymond, Tori Wuthrich, and myself (Emma Edwards), 2 A men: Justin Bandoro and Emerson Glassey, and Berk Ozturk and Youyang Zhao joined them for the Team Time Trial (TTT). 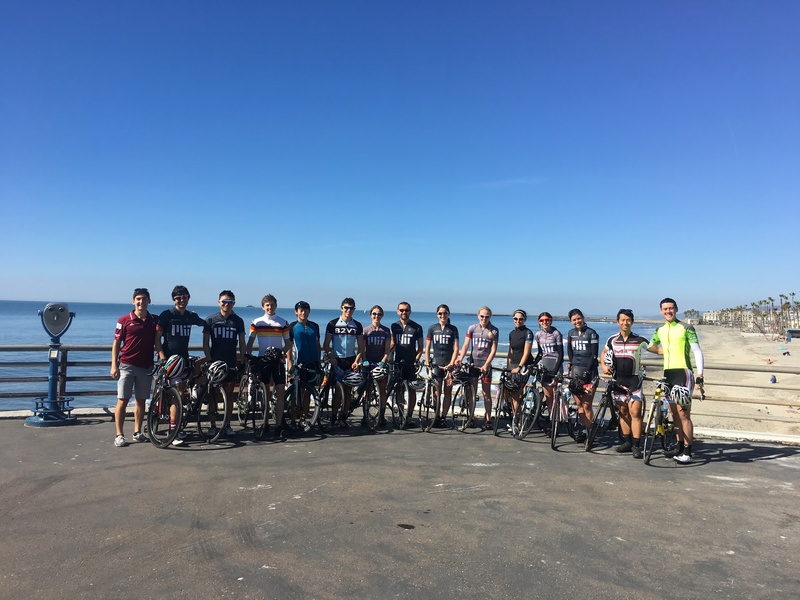 All of the A-level riders did the TTT the first day (Friday), the Road Race the second day (Saturday), and the Criterium the third day (Sunday). Most of us traveled on Wednesday, arriving at our house—a house on a farm which we booked through Airbnb—around midnight. 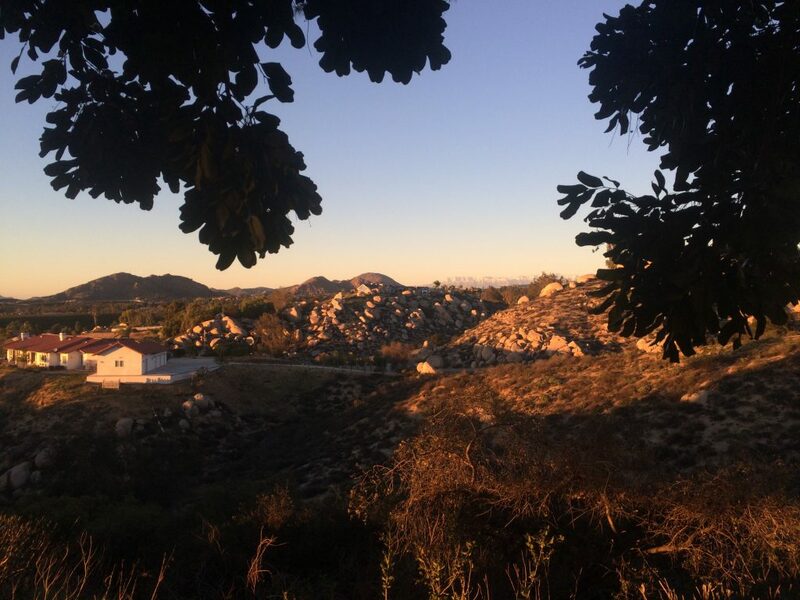 Since we couldn’t see any of the surrounding scenery when we arrived, we were surprised with wonderful views when we woke up. We spent the morning putting our bikes together and meeting some of the animals on the farm, including two dogs and a baby goat! 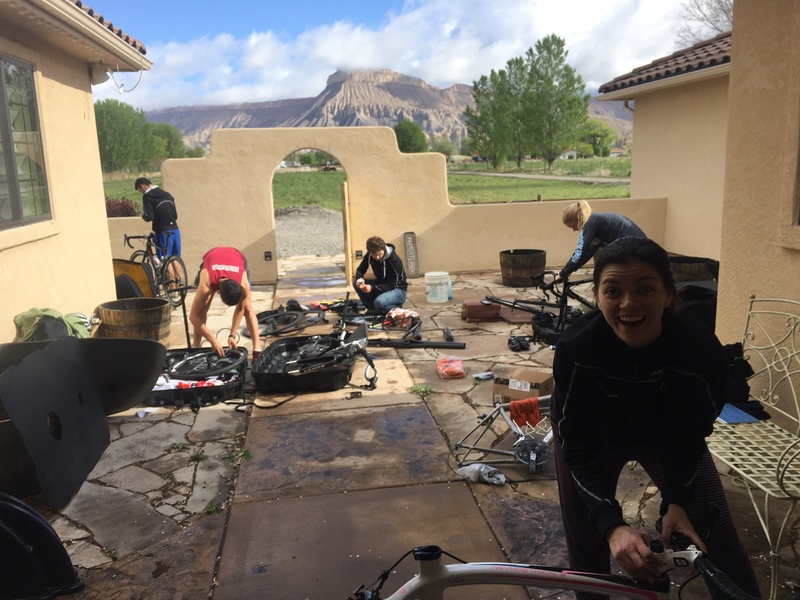 Assembling our bikes with quite the view! That afternoon, we pre-rode the TTT course, and we were unpleasantly surprised with two obstacles: (1) the altitude, and (2) the wind! Of course, the altitude was something we had considered a little bit, but we didn’t expect it to affect it as much as it did. We really noticed a difficulty in breathing and much lower power numbers to what we were used to. We had to rely on to how we were feeling to dictate our efforts (instead of power numbers) much more than usual. We really hadn’t thought about the wind at all! It was extremely gusty, so we were being blown all over the road. This made it very difficult to pace-line efficiently but forming echelons was also difficult because of the gusty nature of the wind. Luckily, it wasn’t quite as windy Friday morning. The gusts weren’t as strong, so we felt a little safer, but it still played a significant role, since benefits from drafting were still decreased. 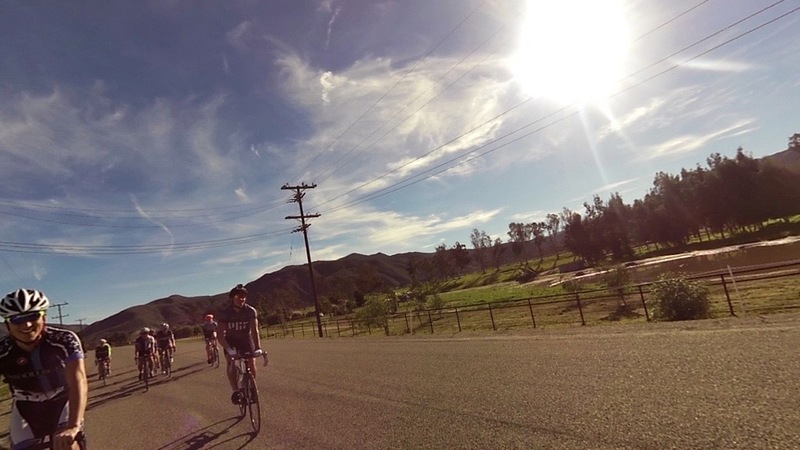 The TTT was about 20 miles, which is longer than any other TTT we do all year. It was an out-and-back: downhill with a head-wind on the way out and slightly uphill with a tail-wind on the way back. This combination made it very tricky to pace, and both the men and the women shed a rider soon after the turn-around. After that, it was a fight against our lungs and the wind. The men finished top-10 and the women finished second! 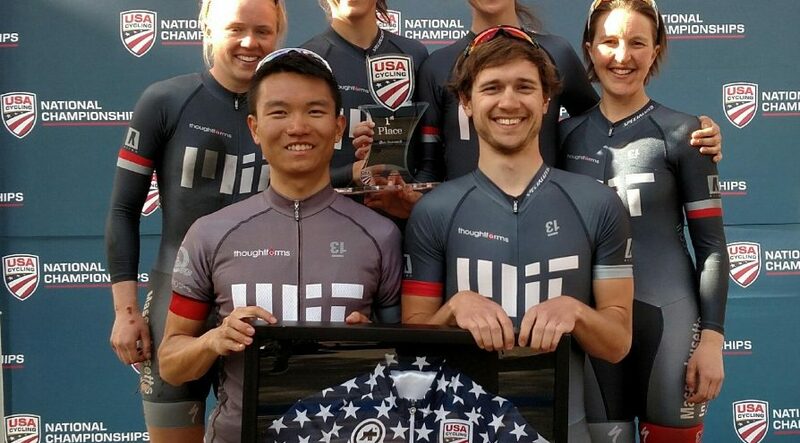 A particularly special moment for me was standing on the podium with my teammates, next to Jen Wilson, an alumni of the MIT team who rode with the Stanford team this year as a postdoc. Women about to start the TTT! Second step of the podium! With our good friend Jen Wilson on the top step! The ladies with our silver medals! 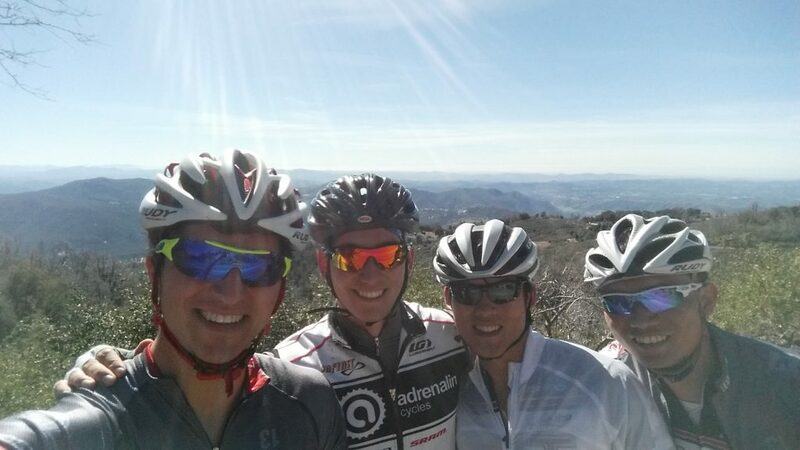 We didn’t have a chance to pre-ride the road race course, but we drove it quickly on Friday afternoon. The course was absolutely stunning, with mountains surrounding us and a great mix of windy descents, hairpin steep accents, and many miles of false-flats. 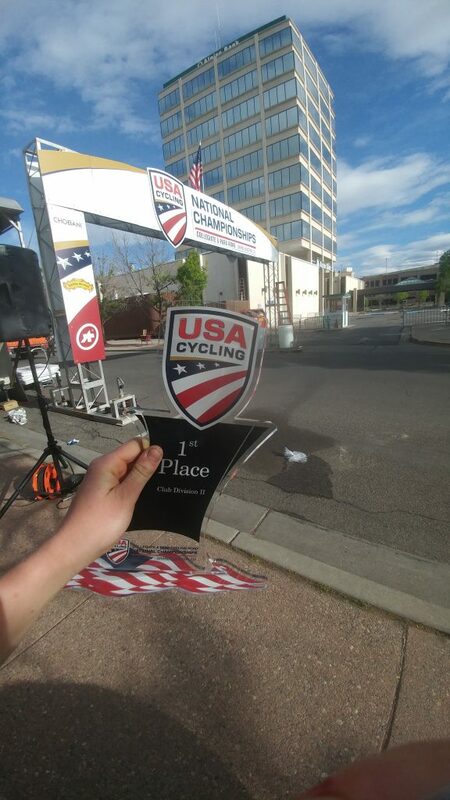 Sunday was the crit in downtown Grand Junction. It was a 6 corner crit around a couple of blocks downtown. It was a really good location for a crit, and it seemed tame except for one corner, which went from quite a wide road to a narrow road, and the corner was smooth and slippery, with a manhole cover in the middle. Tori and Anne both went down on this corner throughout the race (along with many other people!) but were okay! I tried to use the fact that I had only raced 3 miles the day before to my advantage by attacking with 5 laps to go. I held a ~10 second gap for the rest of the race until the second-to-last corner (~200 meters from the end) when I was caught and passed by the group. Katy also finished with the group! Justin and Emerson had a very fast race, with the peloton (of more than 100 people!!) strung out almost the entire race. This was, without a doubt, a great team effort. We would not have been able to get this national title without every single person that went! Special thanks to Kolie for helping us get ready for races and going over strategies and things to think about for each race. I’m very sad that three of the people who went this year (Katy, Anne, and Justin) are graduating this year, but I’m already looking forward to next year so that I can make it more than 3.5 miles into the road race! Nationals was a great team-bonding time, too! And just for good measure: one final pinning picture! I (Emma) have missed the Army Spring Classic the last two years, so I was super excited to do it this year! It’s a relatively close race and famously well-run, so we had TWENTY-SEVEN people come out to race!!! It was the largest crowd we’ve seen all year! 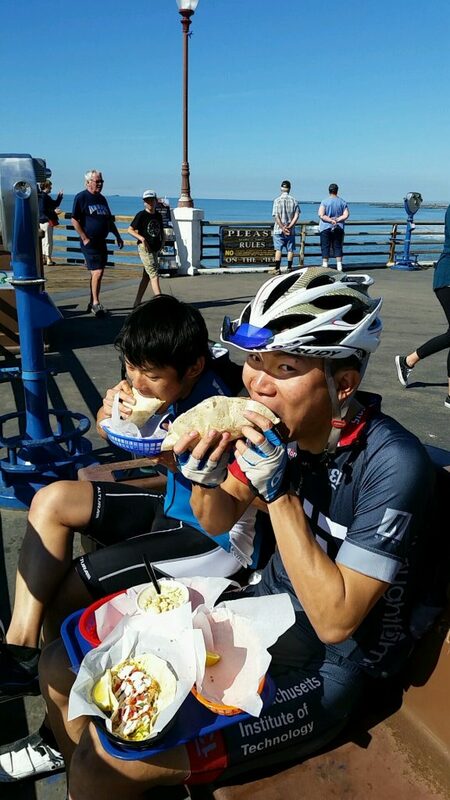 We had the “usual” three events this weekend (Team Time Trial, Road Race, and Crit). 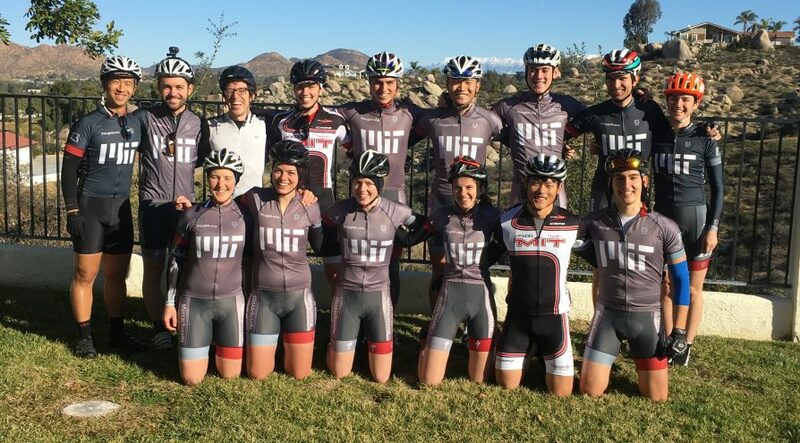 We were super excited about the TTT’s because we had teams for every category except one! And we were even more excited when 6 teams got 1st and the other 2 teams got 2nd in their categories!! It was an awesome way to start out the weekend; we were feeling optimistic about the rest of the races. 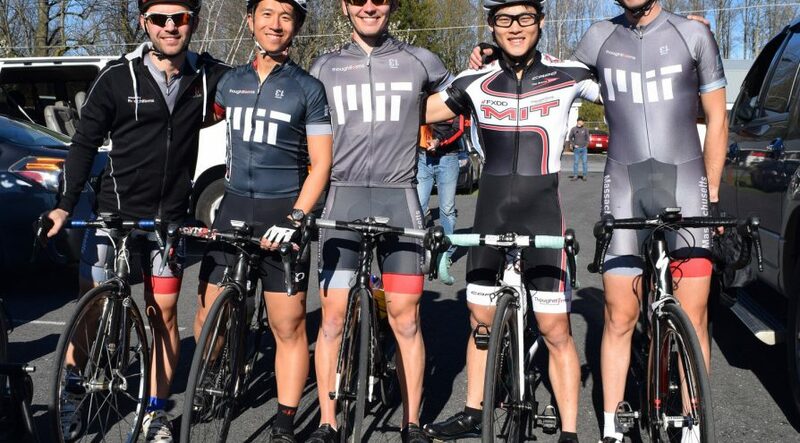 We have three race reports from this weekend: one from me, one from Charles Wu (2nd year grad) and one from Laura Treers (3rd year undergrad). Simple course, downhill then uphill along the same road, this was a real pacing test. Go too hard on the downhill, and you have no energy for the climb back up. We had two C teams, Charles/Charlie/Wade and Brian/Daniel/Ethan. 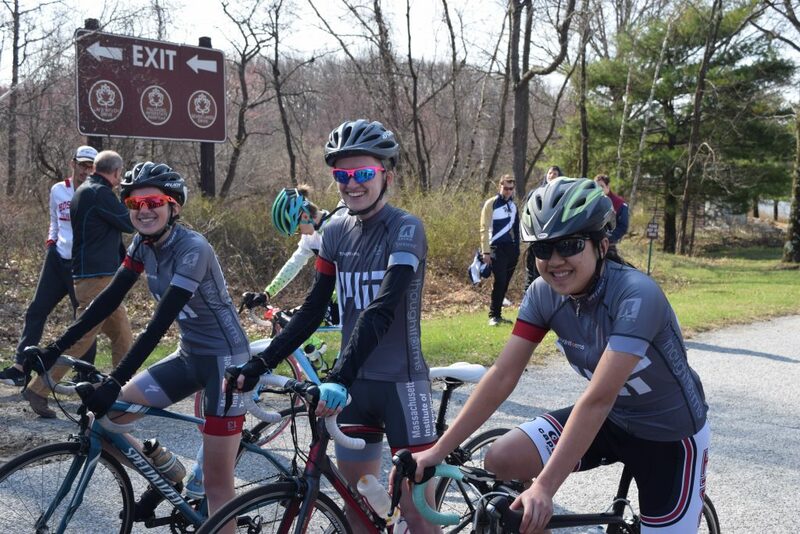 Our first priority was to beat the rest of the schools, and our second priority was to beat the other MIT C team J We went out hard into the headwind and started slowly reeling in the team in front on the downhill portion. After we made the U-turn, we hammered uphill and eventually passed at least 2 or 3 teams before the finish (which means we gained 30-90 seconds on each of them). After the finish, one of the Pitt riders said something to the effect of “Nice job, you made us look silly”. We won the race! This was a really fast course, huge downhill followed by ~12-13min uphill, a rolling middle section, and an uphill finish. We were hitting almost 50mph on the descent (very scary). The C field was, like last weekend, oddly calm, and almost nothing happened the first two laps except for Berk dropping his chain and chasing back on. 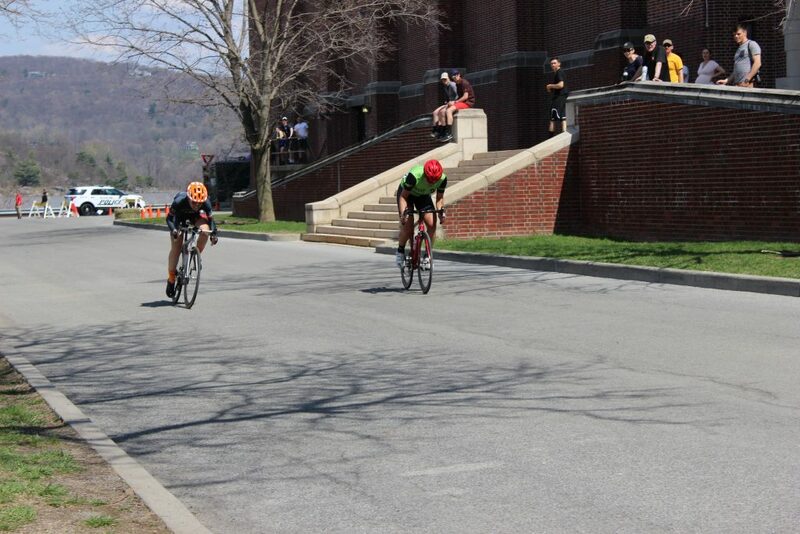 On the last lap, Quinn and Brian set a searing pace uphill which dropped me off the back. I rode for a bit in no-man’s land until Wade caught up to me (he had dropped his chain earlier too) and we had some TTT practice, eventually rolling in 25th and 26th. Up the road, the race ended in a bunch sprint, where Charlie got 4th, Berk 7th, and Quinn 9th. 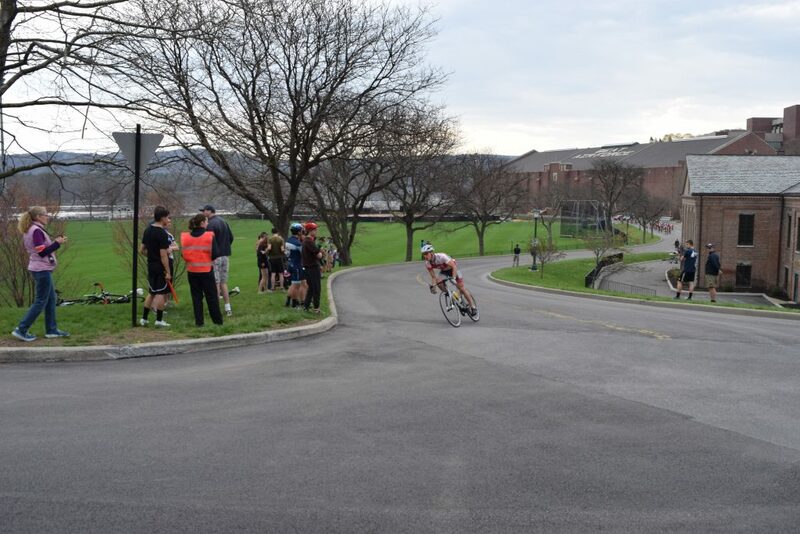 The Army crit course is a weird triangle shape, with a little big-ring hill right after the finish line, a >90 degree corner leading into a back straight, and a fast sweeping right into a short (100m) finish straight. Luckily, I had experience racing it last year and already knew the passing points (no one wants to push up the bumpy af right side on the back straight, so you can make up positions easily). The race started and almost immediately, Berk was away on the attack. He stayed away for most of the race and at one point had almost 20 seconds on the field, winning 2 primes. But he was eventually reeled in (through some miscommunication, MIT chased too much, d’oh). The field started to yo-yo in pace and this caused some minor crashes. I tried to move up as best I could, and after some recovery time, Berk hit the front with me second wheel. 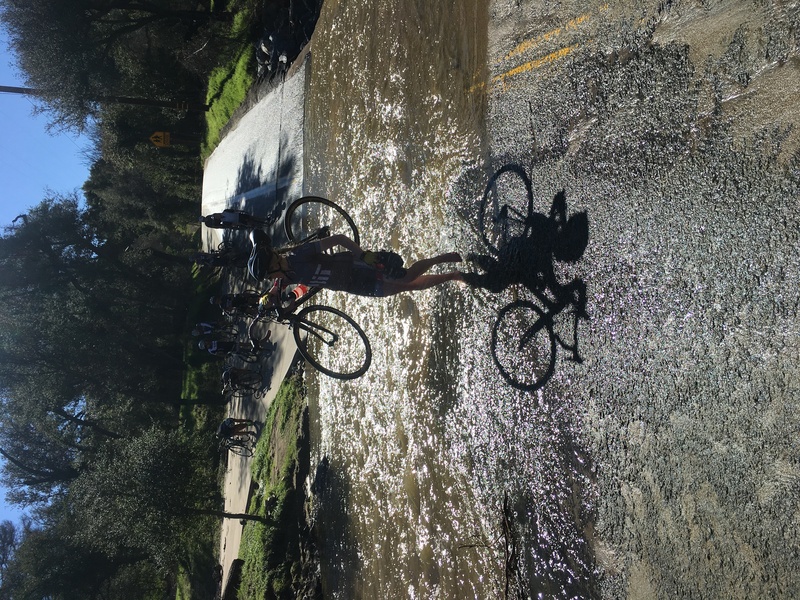 We rode at a high pace for a few laps, and no one had time to attack due to Berk’s crushing sprint leadout. Finally, on the last lap Army tried to launch a two-man attack, but their leadout guy crashed at the top of the hill, flipping over the curb right in front of me and almost taking me out. I lost a bunch of places immediately, but held on the back straight and final sprint for 5th, rueing what might have been. Quinn (7th), Berk (11th), Brian(13th), and Wade(14th) all finished top 20 in a great MIT showing. What a turnout! 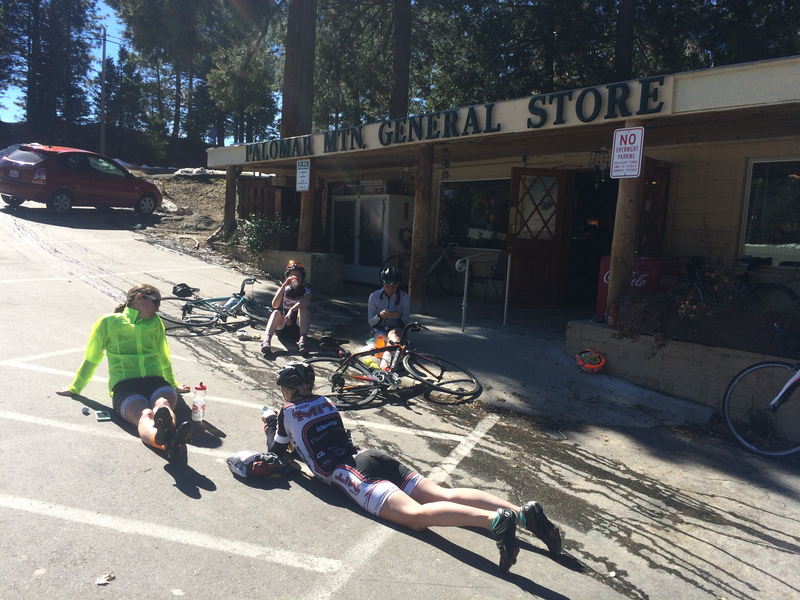 27 riders and a lot of hanging out/banter/eating snacks in the sunshine. 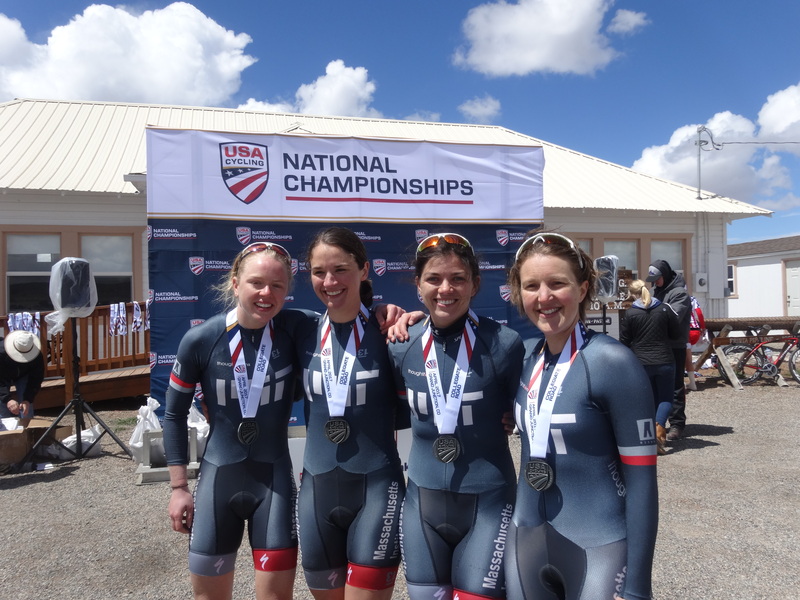 We all but swept the TTT categories, and Kate and Emma won a race each, both in sprint finishes! 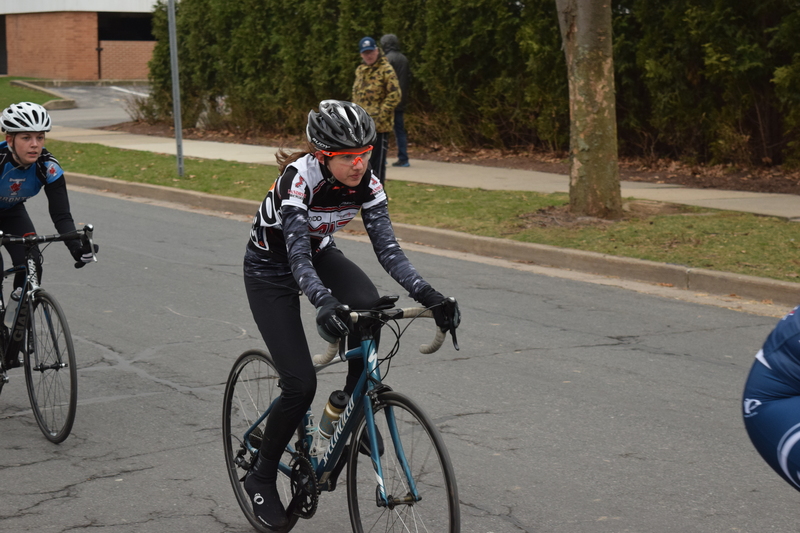 This time, the break went about halfway into the race, with Dani (conference leader, Brown), and Liz (Army). After 5-10 minutes of pushing, I asked people from MIT who were spectating for the gap, and the next time around they said it was only 15 seconds. So we kept the pace high, and seemingly magically the gap grew and grew. 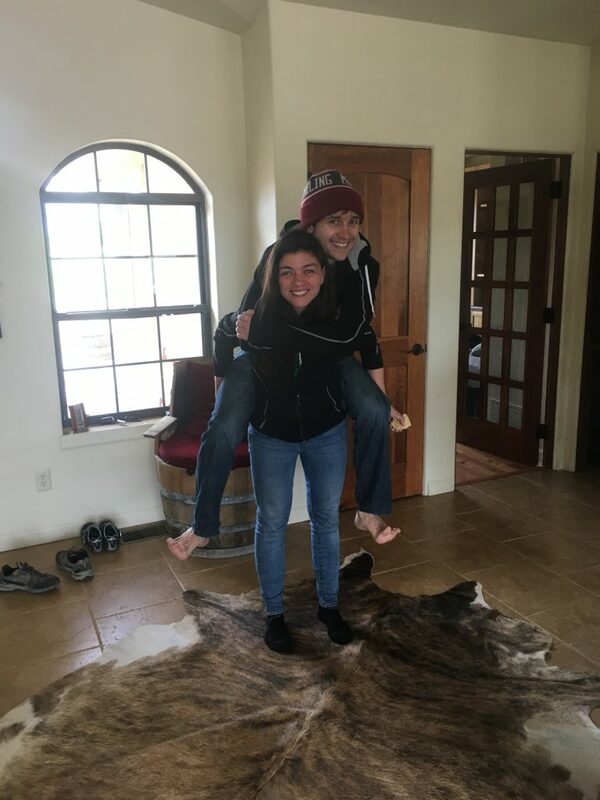 I found out afterwards that this was not magic– this was teamwork!! Tori and Anne did an AMAZING job blocking the rest of the pack. I really don’t think we would have been able to stay away if they hadn’t been there, and I appreciate their help SO much. Unfortunately, with about 6 laps to go Liz took one of the corners too wide and hit a guard rail (it was padded and she was okay other than some road rash), so it was then just Dani and me. We worked together until the last lap. In a head-to-head sprint, Dani would beat me every time. She has an incredible sprint! So knowing that, I stayed on her wheel for the last lap to try to tire her out. Coming out of the last corner she was close to the left hand side of the road, so I went to her right. I put my head down and sprinted as hard as I could and I barely edged her out! It was an amazing feeling, and it meant so much more when I found out how much Anne and Tori had done to help me! This coming weekend is ECCC championships hosted by RISD and Brown. We have another large group coming since it’s so close! The Shippensburg Scurry is one of the farthest races we will go to this year, but it was well worth the seven hour drive! 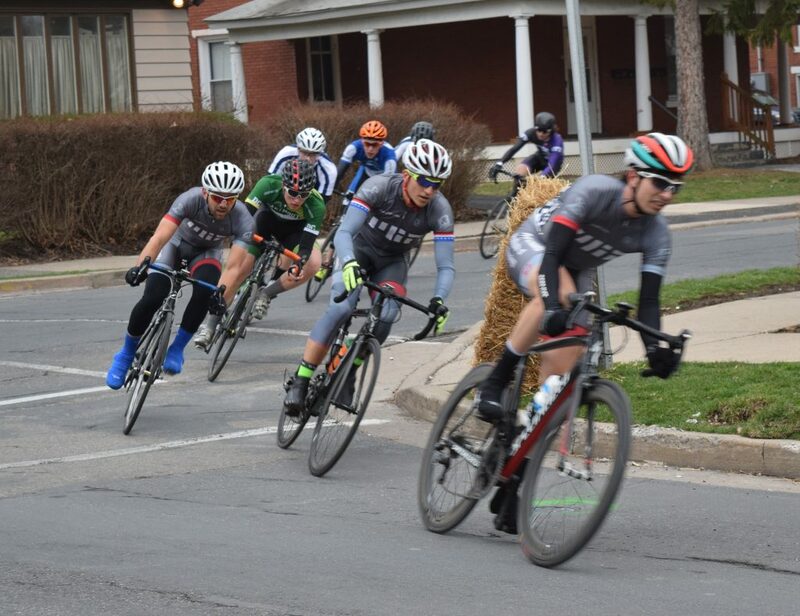 The weekend started with the campus criterium on Saturday, followed by the only hill climb of the season in the afternoon and was rounded out by the Horse Killer Road Race on Sunday. 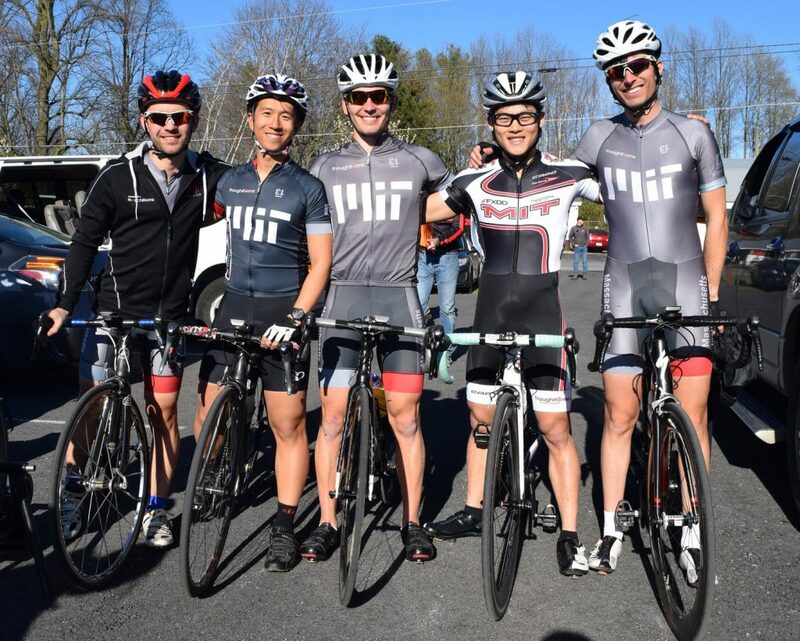 Ten racers came out this weekend to represent MIT, which is great considering the driving distance to get to Shippensburg! 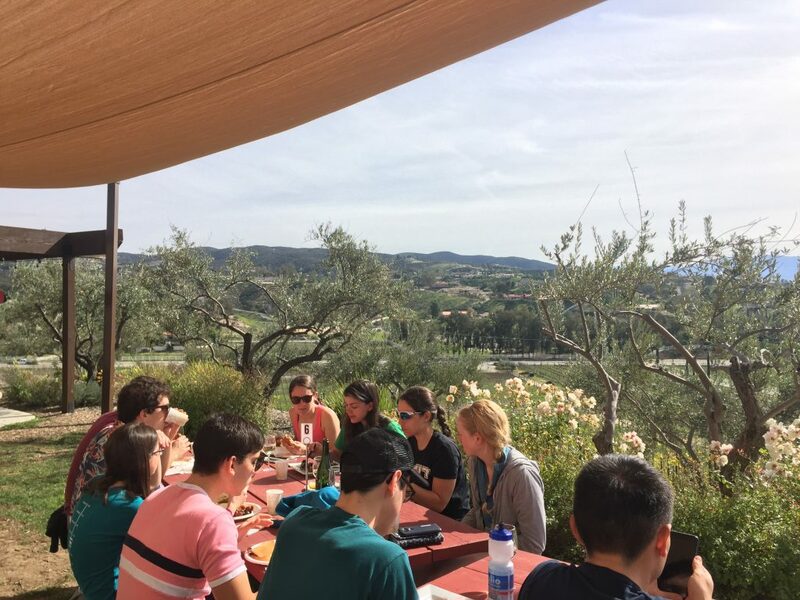 And this was our first weekend with good weather this season, which made all of us very happy. Out of the ten that made it, five (including me) were in the Men’s C category. We were all very excited to try out some team tactics and see what we could do to our field! The criterium’s main features consisted of two wide and fast corners and a kicker of a climb leading into the finish, so it was a past-paced race. 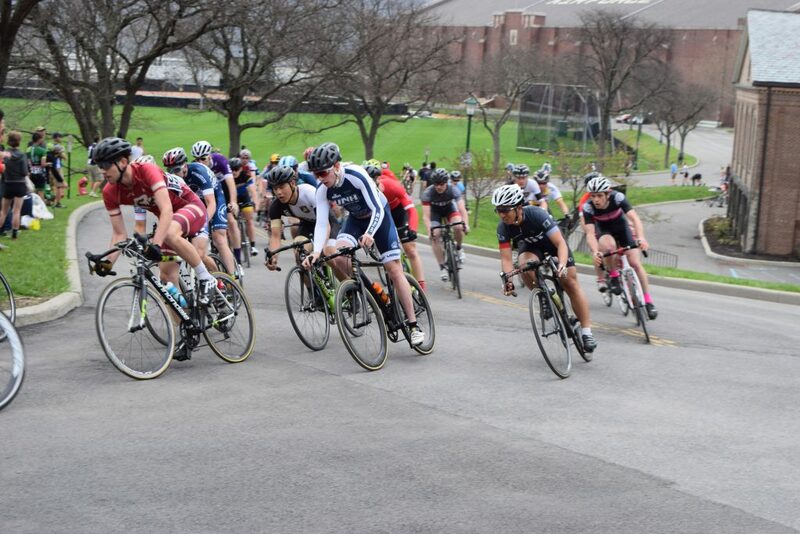 Most of the pack stuck together up until the second to last lap, which made this crit totally different than the last at Penn State. As a team we did great! I was able to snag 1st in the first two primes and Berk got 2nd in the third prime. Throughout the race, Berk was very aggressive and was testing the field with attacks throughout. Coming into the last lap, Quinn was able to secure his spot in a break of 4 while the rest of us were near the front of the pack. In the end, Quinn held on to come in at 4th, Charles came 8th, I came 9th, Wade came 10th, and Berk came in at 15th. 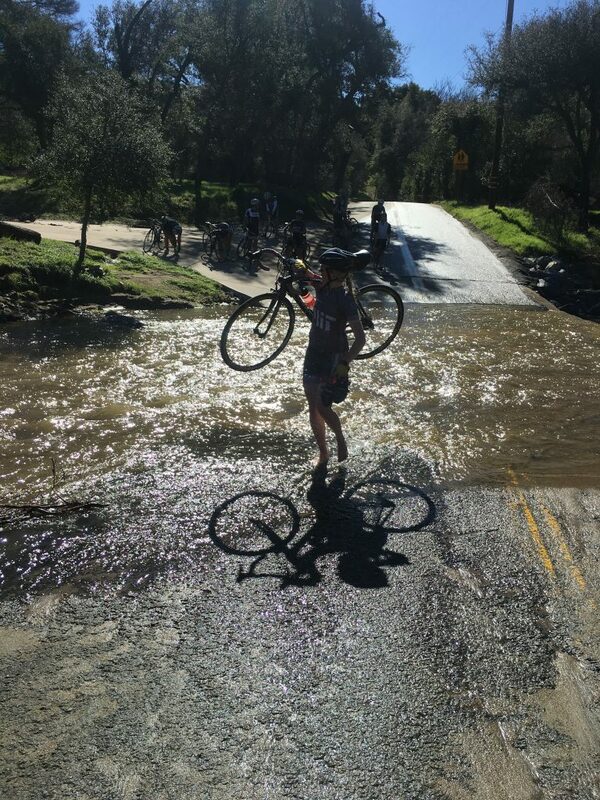 The mass-start hill climb turned out to be a very interesting race. We had time to drive the course before the race and we took that opportunity to check it out and come up with a plan. Charles volunteered to put in a hard effort at the beginning and keep the pace high to catch the other teams off guard. All five of us started in the first line, and thus Charles was able to attack with an 1000W sprint right as the race started. This kept the pace fast and some people were getting shelled off the back before the real climb had even started. 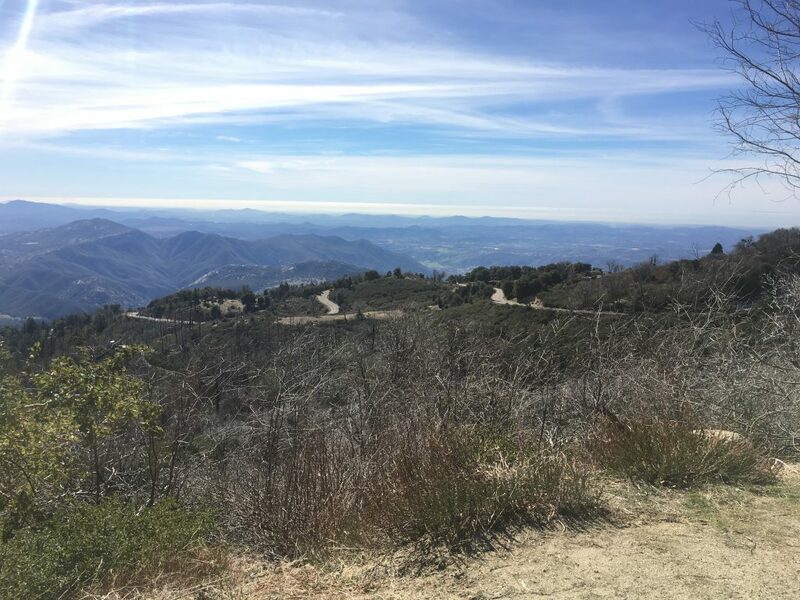 It was a tough 23 minute climb for me, but about halfway through, Wade caught up to me and gave me the inspiration I needed to keep pushing hard to the end(Thanks, Wade!!). Berk secured 2nd place and Quinn came close behind at 6th while Wade and I came in at 14th and 15th. After his valiant effort at the beginning, Charles decided to enjoy the scenery at an endurance pace and still managed to come in at 33rd out of 40, which just goes to show how much pain he caused everyone at the beginning (woo, go Charles!). 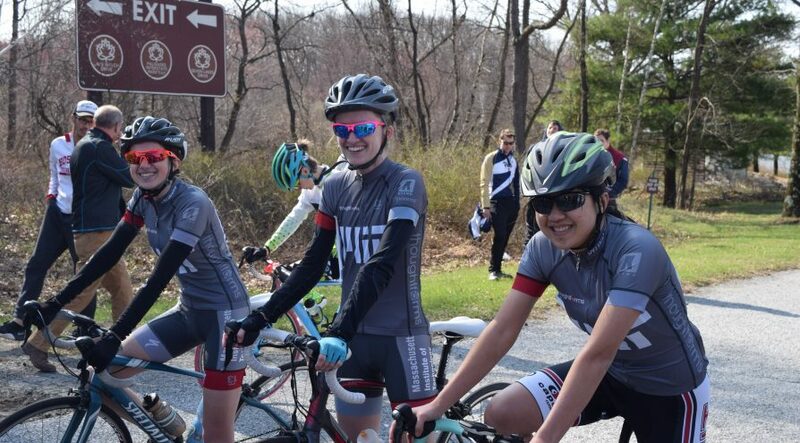 For us the Horse Killer Road Race was 46 miles long and consisted of a short loop followed by two loops that included the climb up Horse Killer Road, which has a 0.9 mile long climb at an average 8% grade ( within this 0.9miles is a 0.4 mile segment at an average 13% grade). 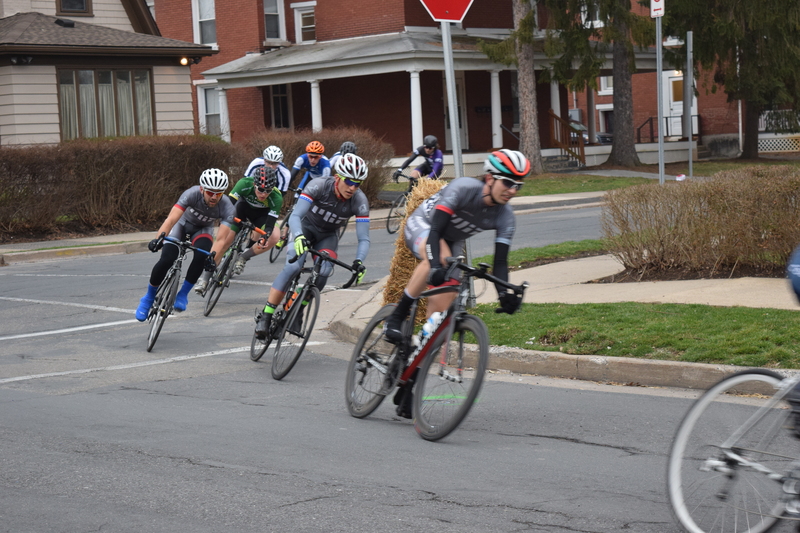 This race was oddly calm for the C field, with only one attempted break away in the first lap, one or two attacks in the second lap, and a very slow pace for the first half of the 3rd lap, right up until Horse Killer Road. Quinn had his third strong finish of the weekend, coming in 5th. Berk was close behind in 8th and I managed to get 13th. The highlight of this race for me definitely has to be during the 2nd lap. Berk, Quinn, and I found ourselves shoulder-to-shoulder at the very front of the pack. Wade was right behind us and decided to attack by finding space to the right of Quinn and just as he passed, Charles slotted in next to Quinn. I wish someone could have taken a picture of this blockade we set up. Sadly Wade’s attack only lasted for about 2 miles because the frustrated riders behind us dangerously crossed over the double yellow centerline to get around us and led the chase to catch Wade. Pinning pictures are consistently amazing. 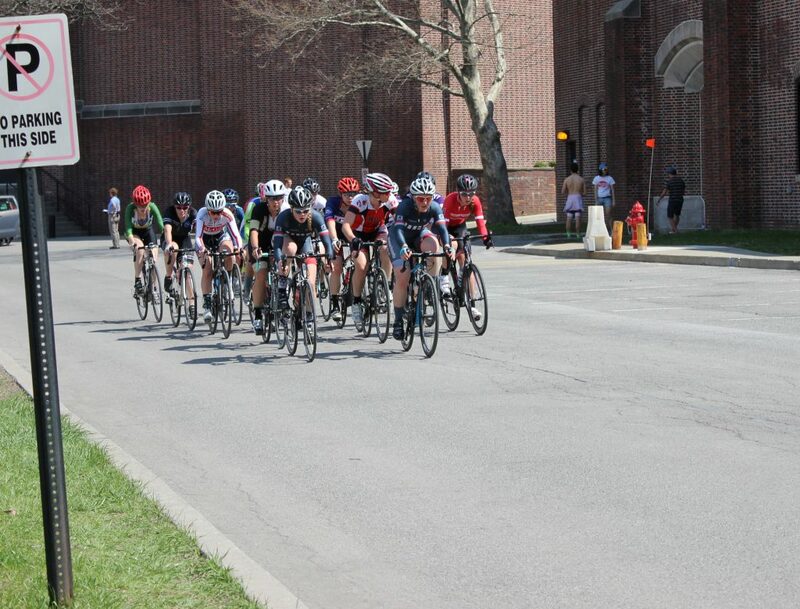 Penn State (aka the Nittany Classic) is a favorite race each year for the MIT cyclists. The famous “Black Mo” climb is the biggest hill we face in the conference (putting our California training camp to good use! ), and the crit is fast and fun, located around Frat Court. 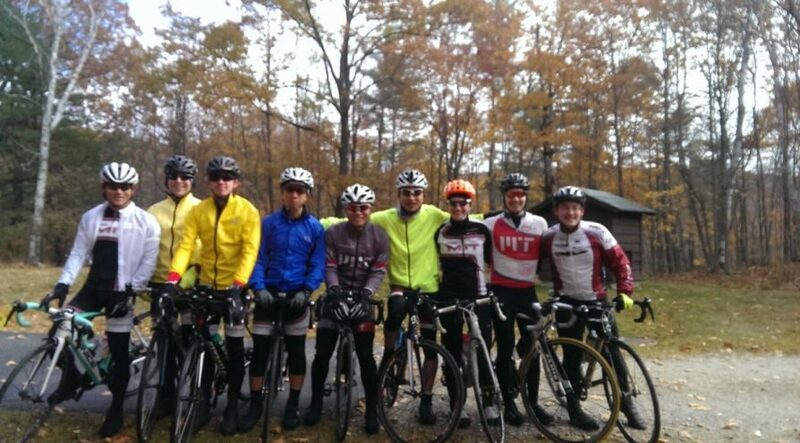 This year we had 11 people make the drive to State College, PA, including 3 new racers! 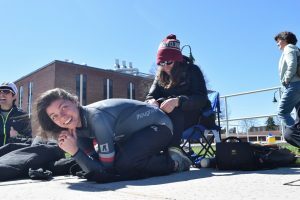 We have 3 race reports this week: one from Dustin Weigl (1st year grad), a joint one from Katy Olesnavage (5th year grad) and I (Emma Edwards, 3rd year grad), and one from Laura Treers (3rd year undergrad). 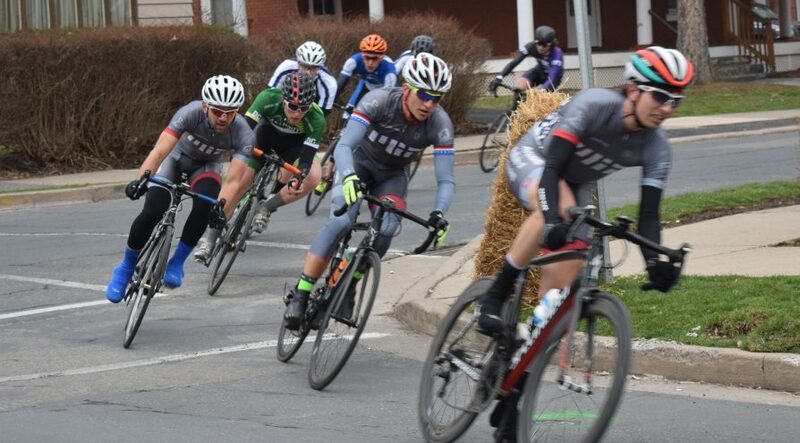 This weekend was my first time racing with the team and I had the chance to start in my first road race with a great squad in Men’s C. With a huge 5 mile climb up Black Moshannon Mountain at the end of both laps I went in with an open mind hoping the team could find a way to work together to put some time into the field. When we got to the climb on the first lap I found myself at the front with nobody else willing to lead so I decided to just put in a consistent effort to see how things went. 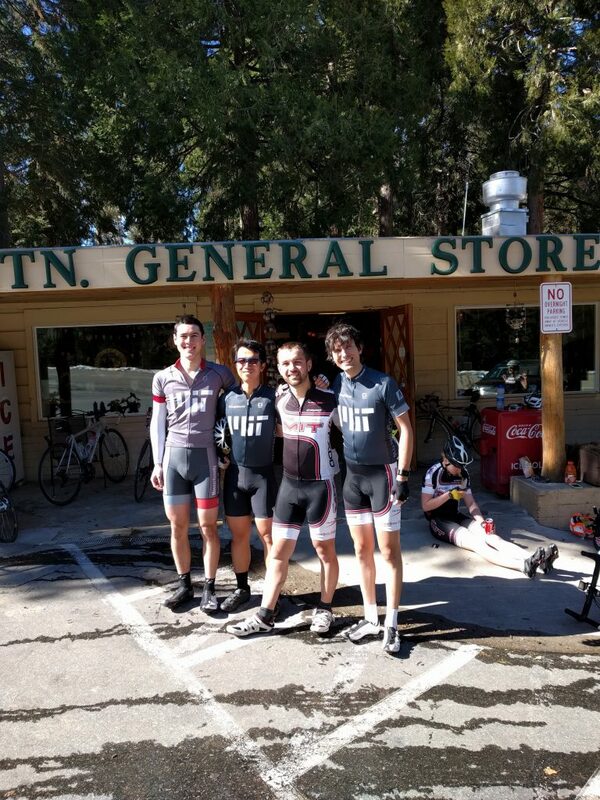 At the top, I found myself in a group with MIT teammate Charlie Nodus and 2 NYU riders with a sizeable gap on the next group. 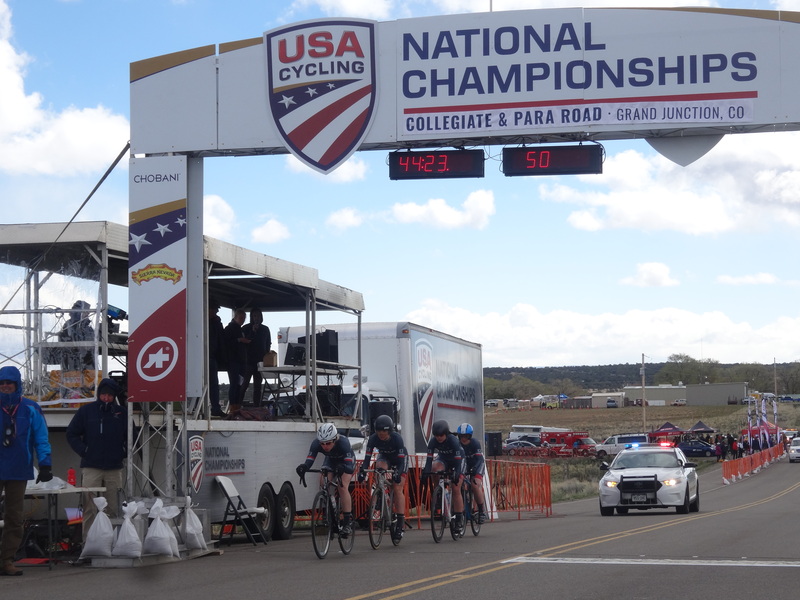 Unfortunately, one of the NYU riders crashed out on the descent into the second lap and we were left with a group of 3. We got organized and kept up a good pace back to the bottom of the climb and the moto let us know we had about 4 minutes on the next riders. About about a mile into the climb, the NYU rider surged and I went with him with Charlie holding a steady pace a little behind. About halfway up I felt some sharp pain in my back that I’ve struggled with in the past so I lightened up, and sadly watched the NYU rider ride away up the hill. Charlie had kept within shouting distance and cruised past me to secure 2nd place and a rider from UVM passed me with later with about half a mile to go. I was of course disappointed to miss out on the podium after leading most of the race but I’m happy I played it safe and know what I have to work on looking towards the rest of the road season. 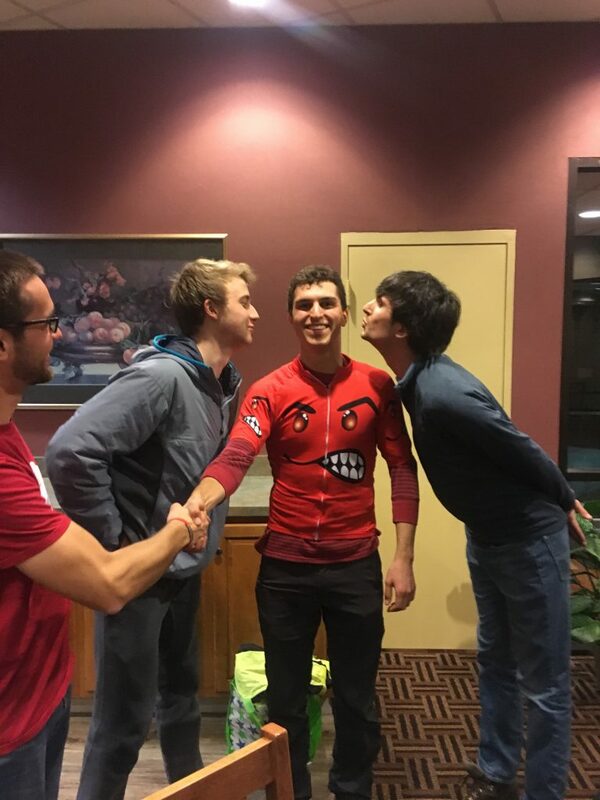 I was also surprised and honored when the team awarded me the most aggressive rider jersey that night so not all was lost! 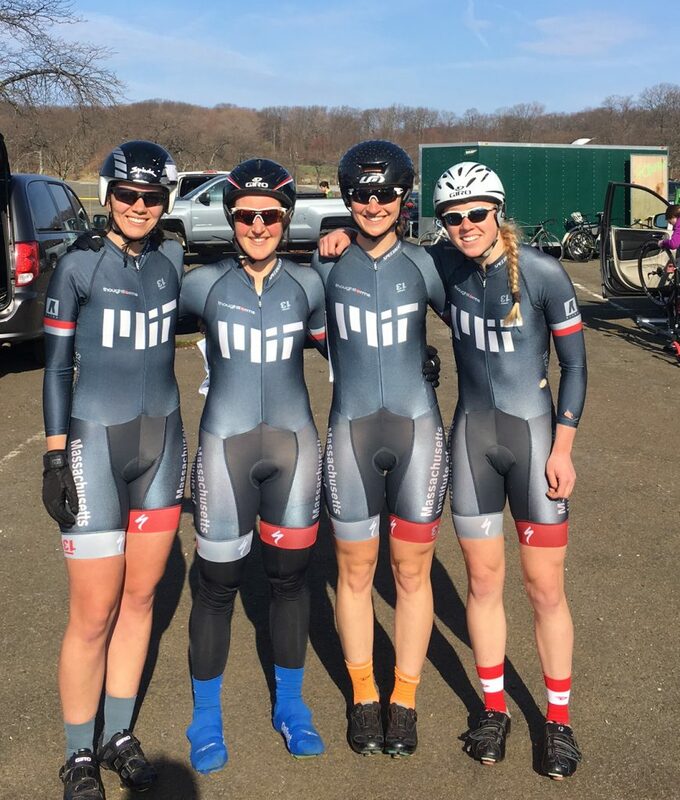 It was incredible to watch MIT riders finishing high in the standings in every category this weekend and I’m excited to see what happens in the upcoming races! Dustin winning the aggressive rider’s jersey! I also must add that Dustin went on to get 2nd in the crit the next day, despite his back issues, just barely losing in the sprint! 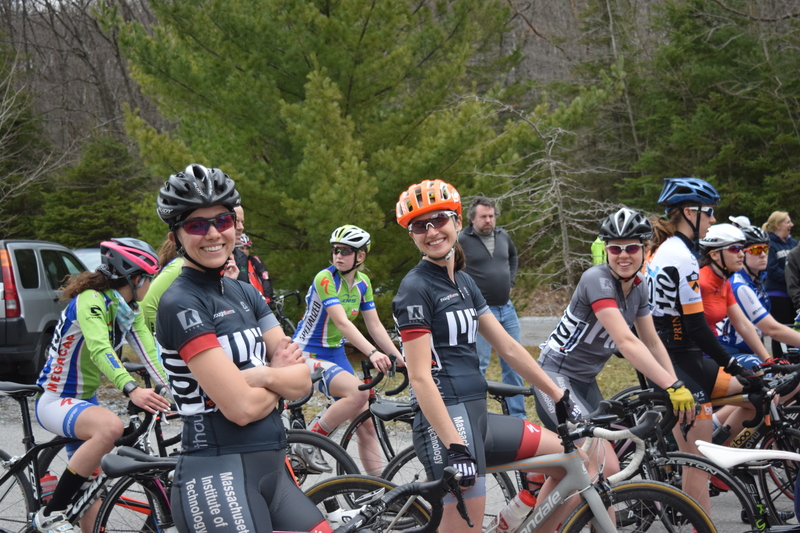 In the women’s A road race, we had Katy, Tori Wuthrich (4th year undergrad), and myself. 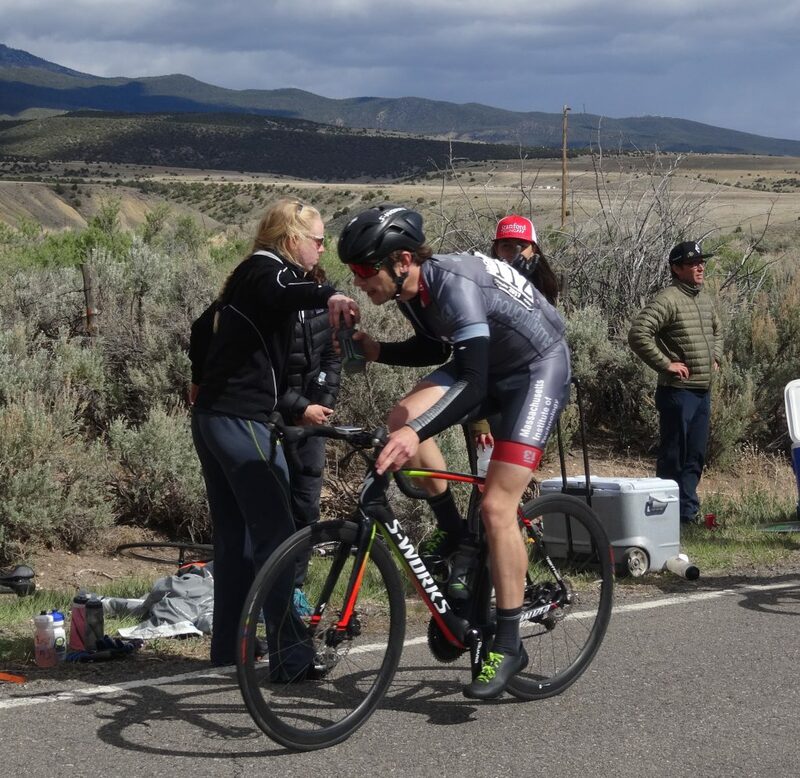 Here is a race report from Katy and I, who somehow managed to get 1st and 2nd in the road race in A’s (2nd and 3rd in A/B)! We were nervous but excited going into the road race. We knew it was going to be very hard, but we were excited and anxious to see how our winter training would pay off. The race started with a big descent and a couple of punchy short climbs. 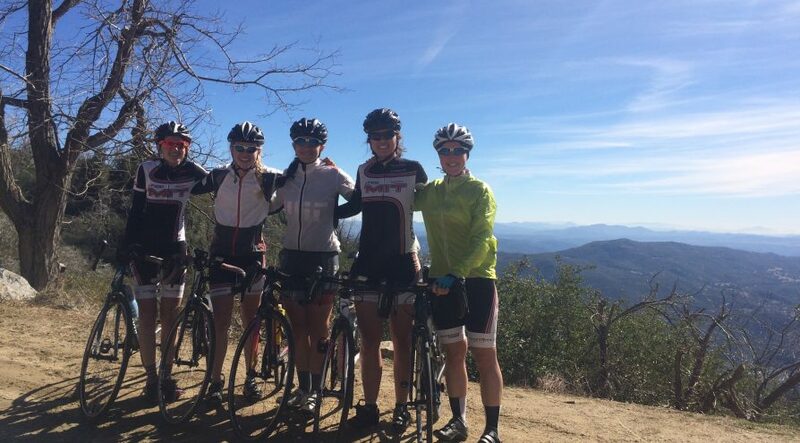 After some pretty hard efforts and a minor crash in the field, suddenly we were in a group of only 10 girls going into the big climb on the first lap. The first climb up Black Mo really strung us out. 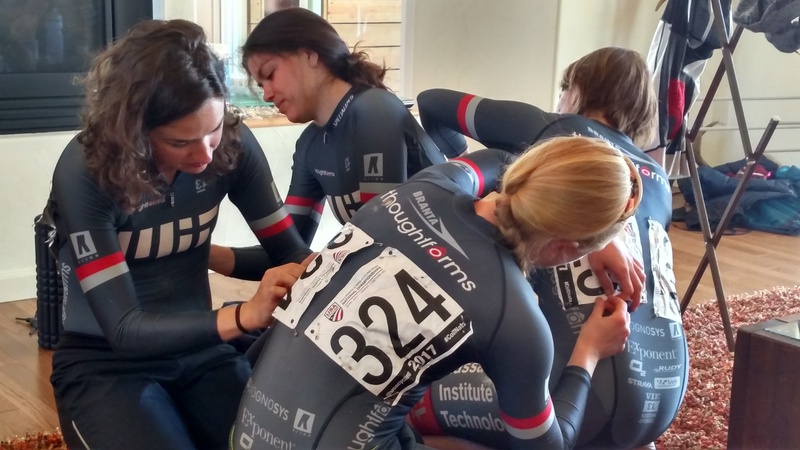 At the top, Katy and I were in a strong group of five women, including conference leader and friend of the team Dani Morshead from Brown University chasing the two leaders, an A racer and an exceptionally strong B racer, who had managed to put a 1:30 gap between us and them. We tried to work together to reel them back in, but they held a steady lead on us. We still kept the pace high, popping riders off our group one by one. By the second climb up Black Mo, Katy and I were the last riders left chasing the two leaders. As a Moto official passed, he pointed out a racer up the road and told us that she was the A racer who had been off the front, and that there was only a 30 second gap between us and her. Our hearts sank a bit because we knew we had to at least try to catch her. With our legs and lungs burning, we took turns getting second winds and encouraging the other to keep it up. 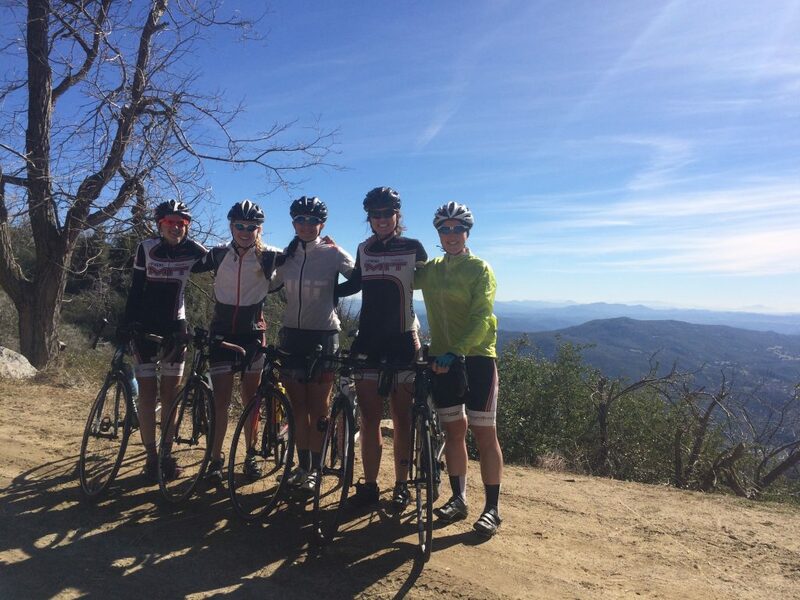 We used the flat (well, rollers actually) at the top of Black Mo to work together and passed her 2k from the finish. We accelerated to make sure she didn’t catch our wheel and kept pushing until the line. 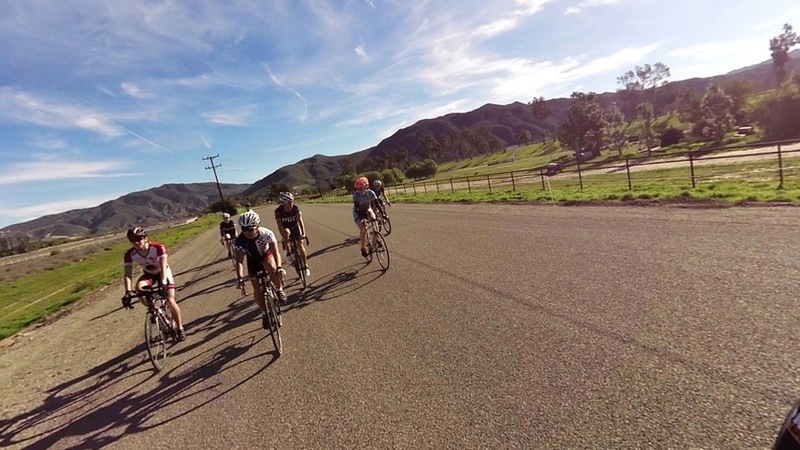 Through the magic of Strava flybys, you can watch how it all played out below! I have to say that the Penn State weekend was amazing, not just for me but for the team as a whole. Everyone did so well in their races, and overall just had a really fun time. This was my first road race of the season, and I was pretty excited/nervous/unsure of how I would do within the Women’s D field. The Saturday road race started with a big descent, where everyone stayed together, and then on the smaller climbs that followed the field started to break up a bit. A few riders went off the front and I followed, pretty amazed to actually find myself in a breakaway group! 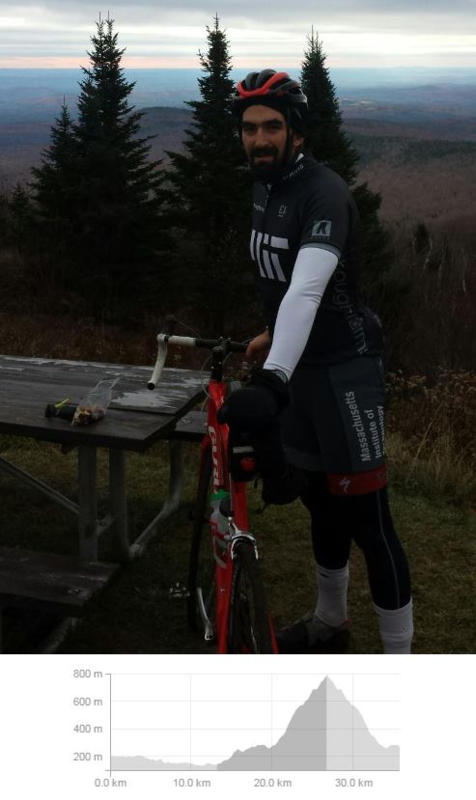 The race ended with a totally epic 5-mile climb up Black Moshannon, which was very challenging but tons of fun. Everyone seemed to split up on the long climb, and I finished the race solo into 4th place, my first ever top-5 finish! 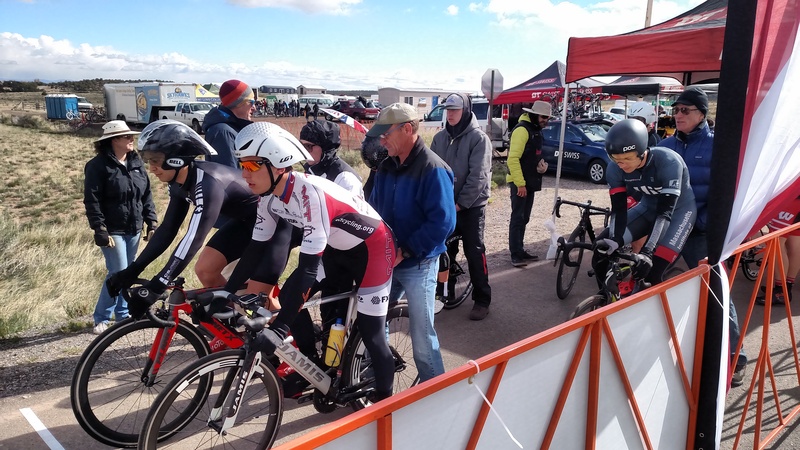 Since my legs were pretty fried after the road race, I didn’t think the crit on Sunday would go very well for me, but I managed to sprint out right at the start and maintained a good position at the front of the field. Around the last 10 minutes of the race, two riders got away from the front of the pack who I wasn’t able to chase down, but I sat in for the last few laps and was able to sprint ahead at the very end to come in third! Overall, I think I surprised myself this weekend with what I was capable of, and was also constantly impressed by the strength and skill of my teammates in all of their races. 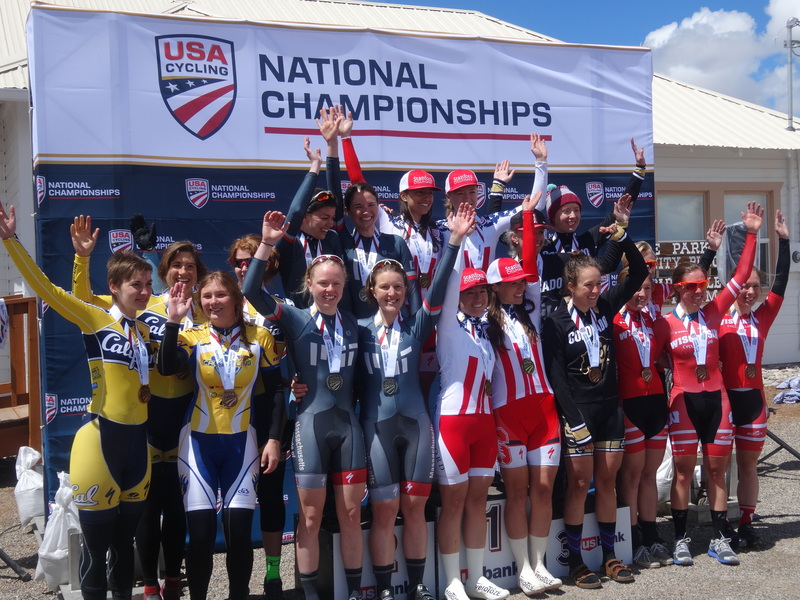 I’ve definitely caught the bike racing bug, and I can’t wait until next weekend! And that’s it for this weekend! We just found out that the Dartmouth/ UVM weekend has been cancelled due to bad weather, so our next race will the the Shippensburg Scurry.